INDIANAPOLIS, Monday, Feb. 24, 2014 – 2013 Indianapolis 500 winner Tony Kanaan unveiled the artwork for the 2014 Indianapolis 500 ticket during a 500 Festival Corporate Members event Feb. 24 at the Crane Bay Event Venue in downtown Indianapolis. 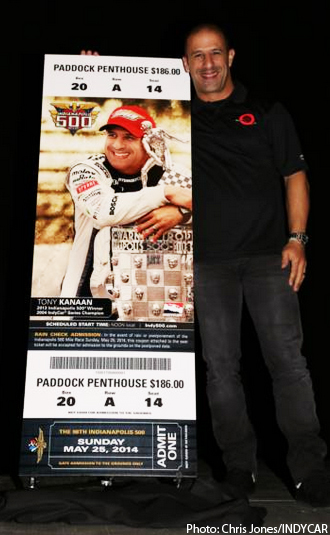 Every 2014 Indianapolis 500 reserved seat ticket will show a smiling Kanaan hugging the world famous Borg-Warner Trophy after his victory in 2013, and the 2014 Indianapolis 500 event logo. Indianapolis 500 tickets traditionally honor and feature the previous year’s champion. Kanaan’s thrilling victory in “The Greatest Spectacle in Racing” came in his 12th career “500” start, tying an event record for earning a victory latest in a driver’s Indy 500 career. After enduring such a long wait, Kanaan was thrilled to see his smiling image on the ticket for the 98th Indianapolis 500. Kanaan’s first Indianapolis 500 win wasn’t secured until the end of the race when the green flag waved to start Lap 198 of 200 following a caution on Lap 194. Kanaan took the lead going into Turn 1, and a few seconds later, three-time Indianapolis 500 winner Dario Franchitti crashed in the short chute between Turns 1 and 2, allowing fan-favorite Kanaan to cruise under caution to the finish as the winner of the 97th Indianapolis 500. The popular Brazilian set a new record winning speed of 187.433 mph, bettering the previous mark of 185.981 mph set by Arie Luyendyk in 1990. Luyendyk held the record winning speed for the longest period in race history, 23 years. In recent months, Kanaan’s spoils of victory for winning the Indianapolis 500 have included seeing his bas-relief image on the Borg-Warner Trophy at the Indianapolis Motor Speedway Hall of Fame Museum, receiving his Baby Borg-Warner Trophy in Detroit, Mich., and seeing his picture this afternoon on the 2014 Indianapolis 500 ticket. Kanaan will drive for a different team during the 2014 IndyCar Series season from the one he won the Indianapolis 500 with. In early October, he signed with Target Chip Ganassi Racing, which has won five of the last six IndyCar Series titles.